This section presents security recommendations to apply in the Bizagi Work portal which are relevant to Bizagi's configuration (application hardening). To carry out the recommendations presented below, you should have already followed what described at Intermediate recommendations. The following recommendations apply when Bizagi runs on a .NET platform independently from the Web server IIS version on which it runs. 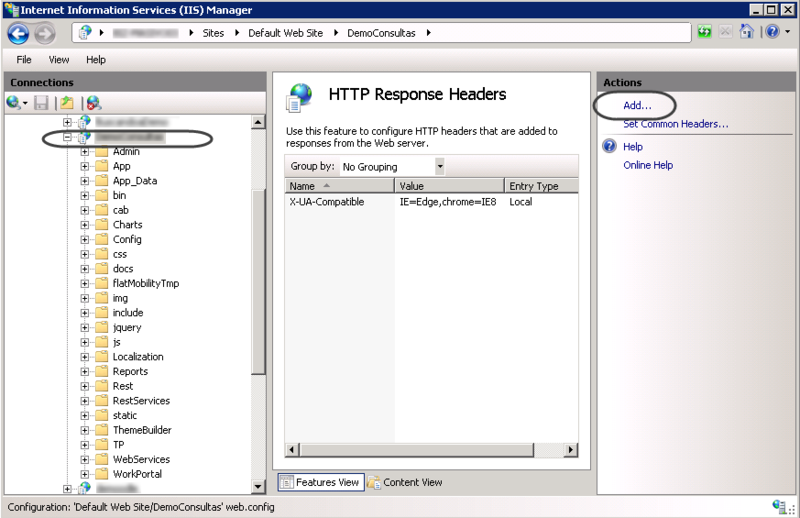 In this section, we describe the configuration for an IIS Web server version 7.5, and such hardening is carried out according to the IIS capabilities. These apply to your testing or pre-production (when you use one) environments as well. This section presents specific steps to mitigate a range of vulnerabilities. 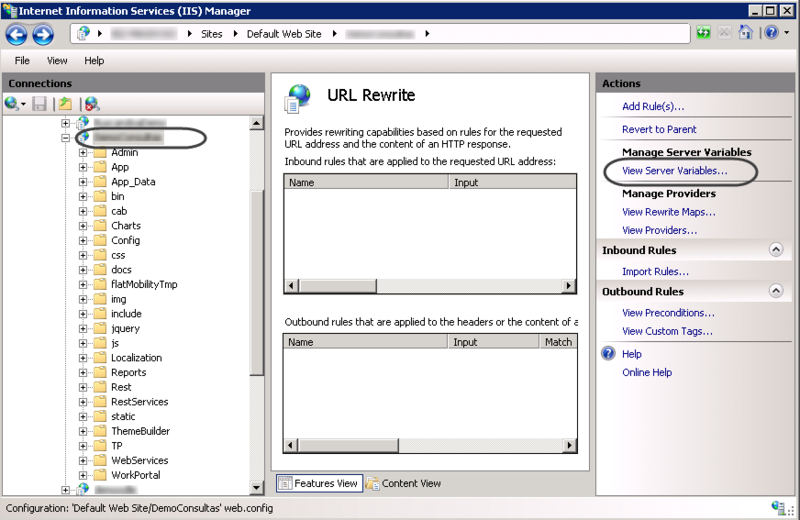 For some of these steps, make sure you have installed the URL Rewrite module for the IIS. 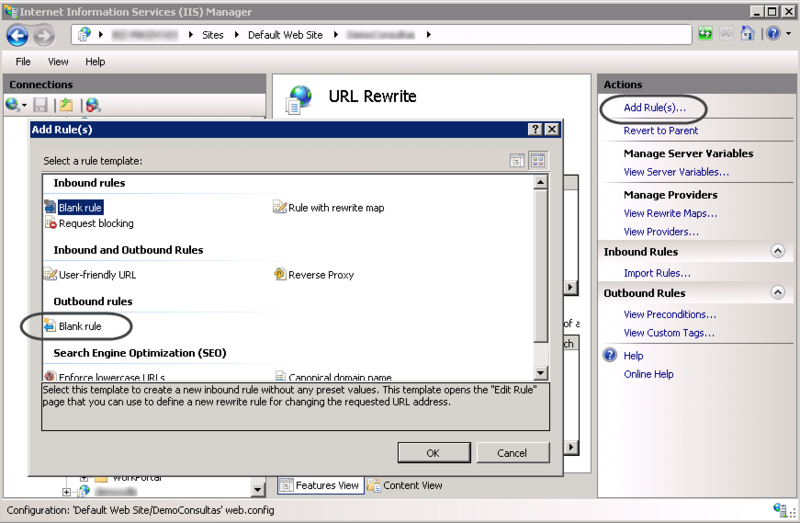 The module in its 2.0 version (for IIS versions 7, 7.5 and 8) is a plugin that can be downloaded directly from http://www.iis.net/downloads/microsoft/url-rewrite. We recommend that you configure rules that rewrite certain values which may leak information regarding the server (this action seeks to mitigate the vulnerability known as information leakage). 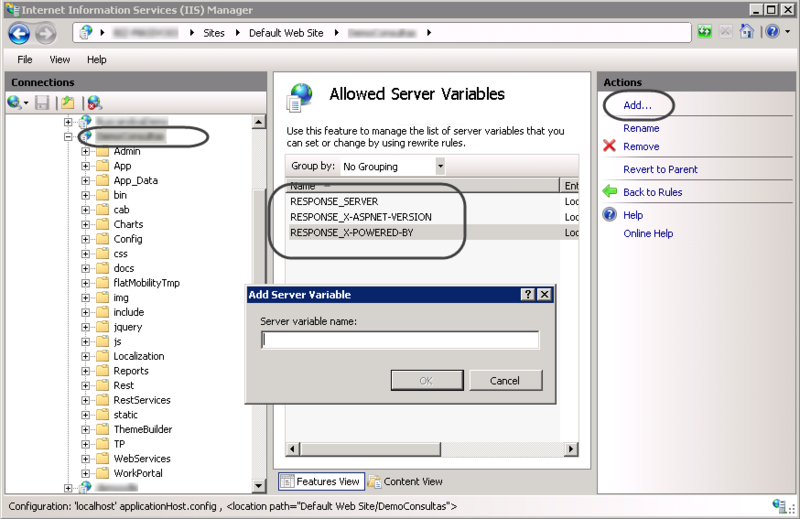 Values providing IIS server information are disclosed by default in the following variables: RESPONSE_SERVER, RESPONSE_X-ASPNET-VERSION, and RESPONSE_X-POWERED-BY. Next, click Back to rules to add the rules that will rewrite values. 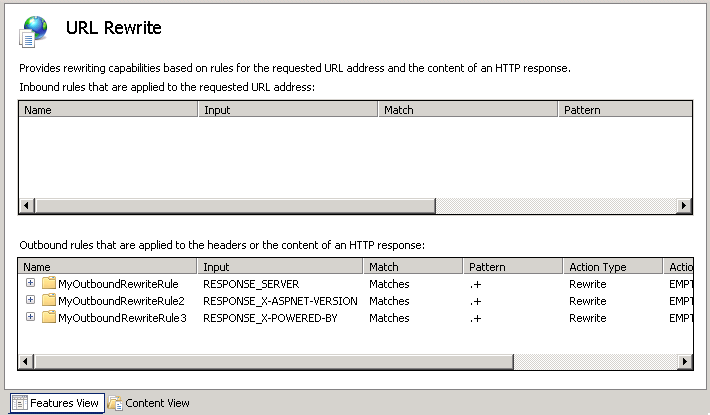 For each variable (RESPONSE_SERVER, RESPONSE_X-ASPNET-VERSION, and RESPONSE_X-POWERED-BY), click Add rule(s).. and select the blank type of rule for the Outbound category. •Name: A name according to your choice. •Variable name: Enter the name of the corresponding variable to rewrite (RESPONSE_SERVER, RESPONSE_X-ASPNET-VERSION, or RESPONSE_X-POWERED-BY). •Variable value: Matches the pattern. We recommend that you establish secure headers to avoid disclosing information which may be used for potential attacks (to mitigate a vulnerability known as ClickJacking). Fixes for those detected issues may include specific solutions for security vulnerabilities. •Plan, coordinate and appropriately test each upgrade. •Upgrade all environments (development, testing, pre-production when applicable, and production). •Before starting the upgrade, take proper contingency measures (e.g backups). •Evaluate customizations or additional security configurations such as the ones listed above, so stakeholders are aware that it is part of the plan to reconfigure certain features after the upgrade. 1. If you use the Bizagi Management Console, back up your customizations before starting. After the upgrade, reconfigure each measure and verify they are still applied. By default, an upgrade done through the Management Console does not check whether you have done modifications to the original files and file structure. 2. 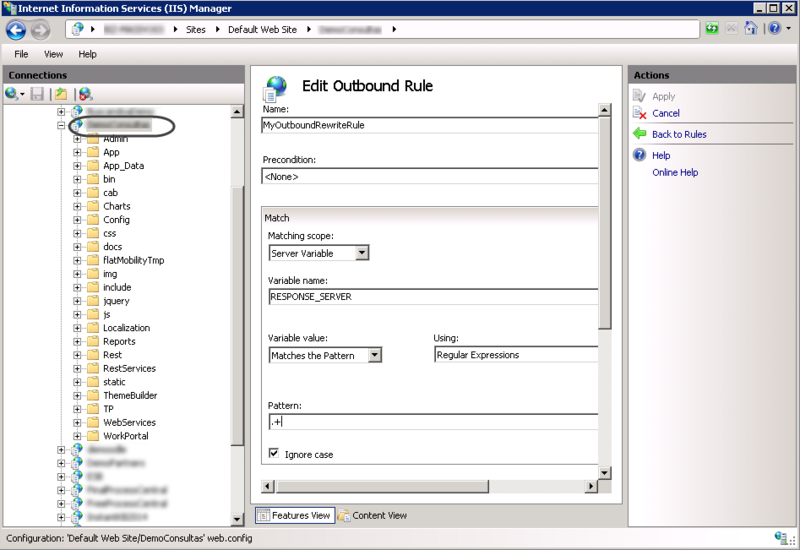 Do the upgrade through a manual procedure (without using Bizagi Management Console). For highly critical security issues, Bizagi may issues hot fixes and recommend that you apply them without waiting for a newer version.